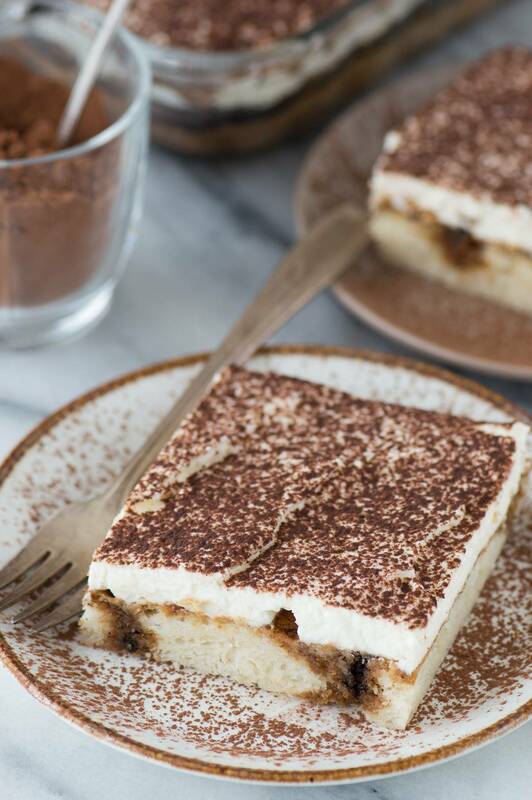 A 9×13 inch tiramisu cake recipe with an eggless frosting alternative! Prior to this summer I had never tried tiramisu. I am totally guilty of being one of those people who will judge a food before I try it. So I figured because I didn’t really know what tiramisu was and because it it had some questionable ingredients (back in my naive days!) I wrote it off. 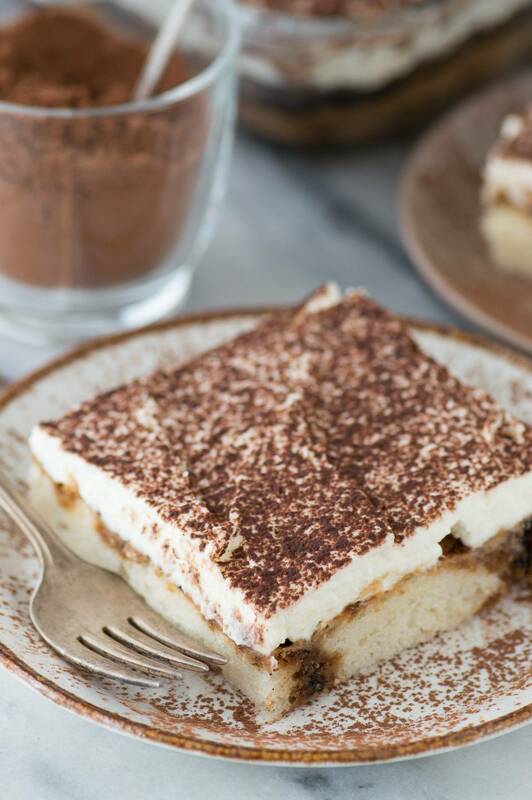 How tiramisu came into my life wasn’t actually my choice – well sort of, haha. This past August I had my last day as working as a nanny and when I came home that day, Ryan was home (which is unusual for him to be home before me) and waiting for me was a homemade gluten free tiramisu cake – that Ryan made from scratch!!!! Talk about baking skills. Plus I have to mention that the kitchen and all the dishes he used were clean and put away – he knows how to love me! So Ryan lovingly made me a tiramisu cake. Ryan likes trying new things and really likes cooking/baking things he hasn’t made before. The cake looked really good and smelled delicious. Ryan was almost about to tell me what ingredients he used to make it, but I thought it was a good idea if he withheld that information until I tried it. Long story short, it was AMAZING! 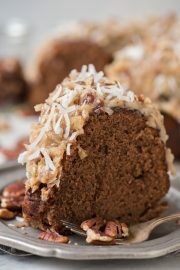 So when my friend Lindsay who blogs at Life, Love, and Sugar asked me to share a recipe from her new cookbook (it actually came out yesterday!) I immediately picked her Tiramisu Cake because I wanted more tiramisu in my life. 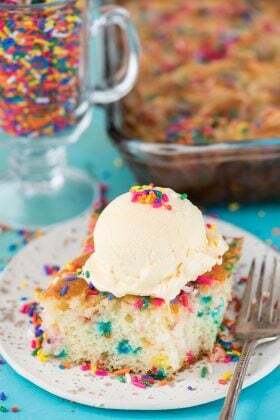 Lindsay’s recipe from her book Simply Beautiful Homemade Cakes is easy to make and I love that it’s made in a 9×13 inch pan because everyone one has that pan size. Plus, this is the kind of cake that easily feeds a crowd. 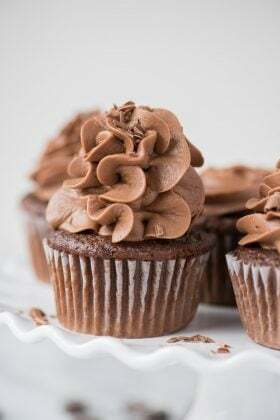 Lindsay’s directions are easy to follow and since this girl is a cake GENIUS, I’m pretty confident that every recipe in her book is just as good as this one was! I made a slight adjustment in the preparation of the frosting. Typically tiramisu filling/frosting calls for egg yolks. I prefer to follow an eggless recipe and I feel like it tastes the same as the filling with eggs! Either way, I know you’ll enjoy this recipe! 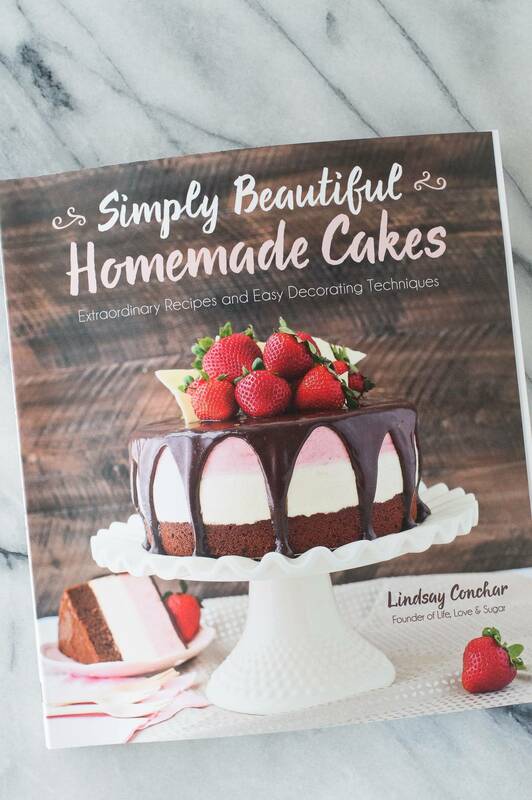 Order a copy of Lindsay’s book Simply Beautiful Homemade Cakes here! A 9x13 inch tiramisu cake recipe with an eggless frosting alternative! Grease a 9 x 13-inch (23 x 33-cm) cake pan and preheat the oven to 350°F (176°C). To make the cake, cream the sugar and butter with a mixer until the mixture is light and fluffy, about 3 to 4 minutes. Add the vanilla extract and sour cream and mix until well combined. Add 3 of the egg whites and mix until well combined. Add the remaining 3 egg whites, mixing until well combined. Scrape down the sides of the bowl as needed to be sure all the ingredients are well incorporated. Combine the flour, baking powder and salt in another bowl, then combine the milk and water in a small measuring cup. Add half of the flour mixture to the batter and mix until well combined. Add the milk mixture and mix until well combined. Add the remaining half of the flour mixture and mix until well combined. Scrape down the sides of the bowl as needed to be sure all the ingredients are well incorporated. Pour the cake batter into the cake pan and bake 30 to 34 minutes, or until a toothpick inserted in the center comes out with a few crumbs. Remove the cake from the oven and allow it to cool completely. Once the cake is cool combine the hot water, espresso coffee powder and Kahlúa in a small bowl. Poke holes all over the top of the cake using the end of a wooden spoon or a similar tool. Drizzle the espresso mixture over the holes and allow it to soak in. In a mixing bowl, beat the mascarpone until smooth, 2-3 minutes. In separate chilled mixing bowl, beating the heavy cream and powdered sugar for 4-6 minutes or until stiff peaks form. Add the whipped cream to the beaten mascarpone and beat gently with the electric mixer until combine, about 1 minute. Spread the mascarpone mixture evenly over the top of the cake. Dust the top of the cake with the cocoa powder. Refrigerate the cake until you are ready to serve. 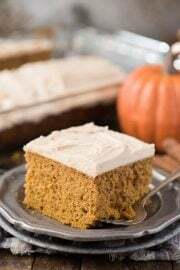 This cake is best when stored fully covered in the fridge for 2 to 3 days. 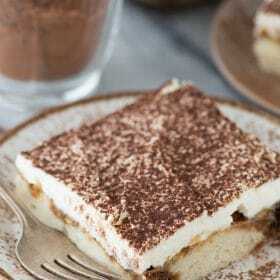 I’m becoming a tiramisu fan!! hello! what do i use if i can’t find mascarpone cheese? it looks delicious and would love to try it..
Hi Jasen! I use Bob’s Red Mill gluten free flour and it works as a one for one substitute! Are the egg whites beaten prior to adding to the butter mixture?